DVI (Digital Visual Interface) is the standard interface that was designed to replace the analog VGA interface that has been around for a considerable length of time. But to make it easier for people to adapt the DVI standard, the designers need to include analog signals so that users can adapt DVI while still using their older equipment. DVI-I (Integrated) is the connector that is capable of transmitting both digital and analog signals while DVI-D (Digital) is a connector that cannot transmit analog signals. Although a Dual Link DVI connector has more pins, a standard DVI-I connector has the complete pin set to facilitate a digital and an analog connection. This is not the case with DVI-D cables as the four pins that are supposed to carry the analog signals have been removed. The corresponding DVI-D ports also lack the slots to which these four analog pins are supposed to fit into. This means that you cannot fit a DVI-I connector into a DVI-D port as the analog pins would have nowhere to go. To further prevent the possibility of a DVI-I male plug fitting into a DVI-D port, the designers also modified the long flat pin that can be found on one side of the connector that is supposed to be right in the center of the analog pins. This long flat pin has been reduced in size for DVI-D connectors along with the corresponding slots on the port. This means that you cannot fit a DVI-I male plug into a DVI-D port even if you manage to remove the four analog pins on the male plug. 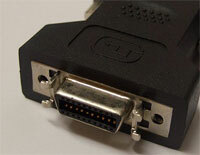 But with a DVI-D male plug, you can easily fit it into a DVI-I port without any hassle. This is beneficial since all ports on graphics adapters are DVI-I and you can use a digital only LCD display using a DVI-D connector without any problem. Ben Joan. "Difference Between DVI-I and DVI-D." DifferenceBetween.net. May 19, 2011 < http://www.differencebetween.net/technology/difference-between-dvi-i-and-dvi-d/ >.